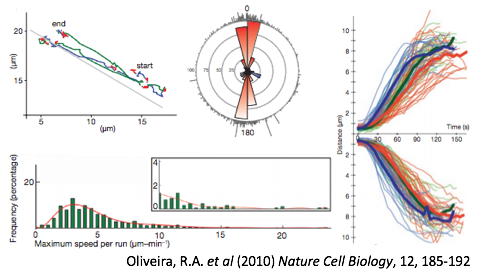 Open source software for the analysis of intracellular particle motility and cytoskeletal polarity. ParticleStats was created by Russell Hamilton and Ilan Davis at the Department of Biochemistry, University of Oxford and in collaboration with the Micron Advanced Imaging Facility. The dynamics of particle movement, such as in the case of motor driven transport, can be explored through the calculation of runs and pauses in the movement. Statistical comparisons can be made between different populations of particles such as in the case of a wild type Vs mutant. The directionality of a set of tracked particles is determined using directional statistics. The windmaps are a novel way of visualising bias in the travel direction of particles. Further evidence is provided with rose diagrams and radial histograms.